24/7 Universal Translation Studio Noted As The Number One Professional Translation Service. May 8, 2015 - PRLog -- Global. - 24/7 Universal Translation Studio has been offering professional document translation services for five years now. The company delivers translation services in over fifty languages and to a variety of different industries. 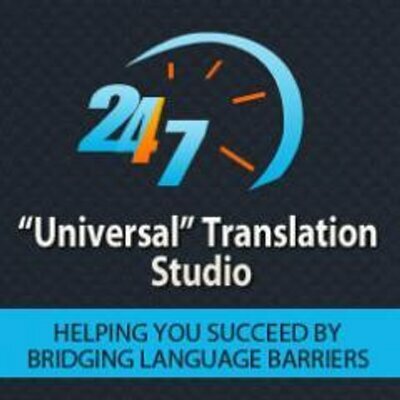 24/7 Universal Translation Studio (24/7 UTS) works to provide accurate translation services backed by outstanding customer service. The company boasts a ranking as the #1 translation service provider out of 348,000+ contractors. “We offer twenty-four hour support seven days a week and we have competitive pricing. Busy professionals can always rely on 24/7 Universal Translation Studio to be readily available to work on translating important documents,” said a representative from the company. 24/7 UTS boasts a team of professional native translators from around the globe. The document translation services include; App translation, Website translation, Document translation, Legal document translation, Technical document translation, Medical Translation, Finance translation, Book translation, and custom projects upon request. The company helps decipher everything from genealogy documents and legal documents to medical records and financial reports. 24/7 Universal Translation Studio is able to work within the confines of an NDA. Confidentiality agreements may be submitted directly to the company with the quote to ensure all projects remain private. This said, 24/7 UTS has earned its reputation based on accuracy, customer service, and its ability to treat every project with the upmost discretion. All of 24/7 Universal Translation Studio’s translations are done by certified native translators. Once the project is awarded, the company internally divided the translation process into two phases. In Phase A one of the certified native translators, translates the documents and in Phase B another certified native translator proofreads the translation to ensure the final translation is flawless. This is a free and added bonus service. Members of the media are invited to speak with a representative of 24/7 UTS by utilizing the contact information below.